I am very pleased to report that I have received the results for my Allen second cousin's DNA test. This is exciting because he shares the only set of great grandparents from whom I have had no genetic data up to this point. 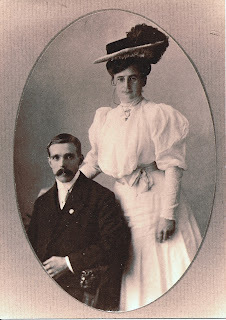 Our common ancestors are our great grandparents George Henry Allen (1880-1965) and Fredrikka Herstad Allen (1871-1953). They were both immigrants to the United States around the turn of the 20th Century. George was from Australia and Fredrikka was from Norway. They met in San Francisco and married shortly after the Great Quake of 1906. I descend on my paternal side through their daughter Wanda and this cousin descends maternally through their daughter Flora. I was surprised to see how much DNA we all share with our Allen Cousin. My family shares more DNA with him, across the board, than we have with any of the other cousins in my "Second Cousin Studies". My sisters and I share well above the expected percentage for a second cousin of 3.125% of DNA in common with our Allen Cousin: 4.45%, 4.27% and 3.64%. 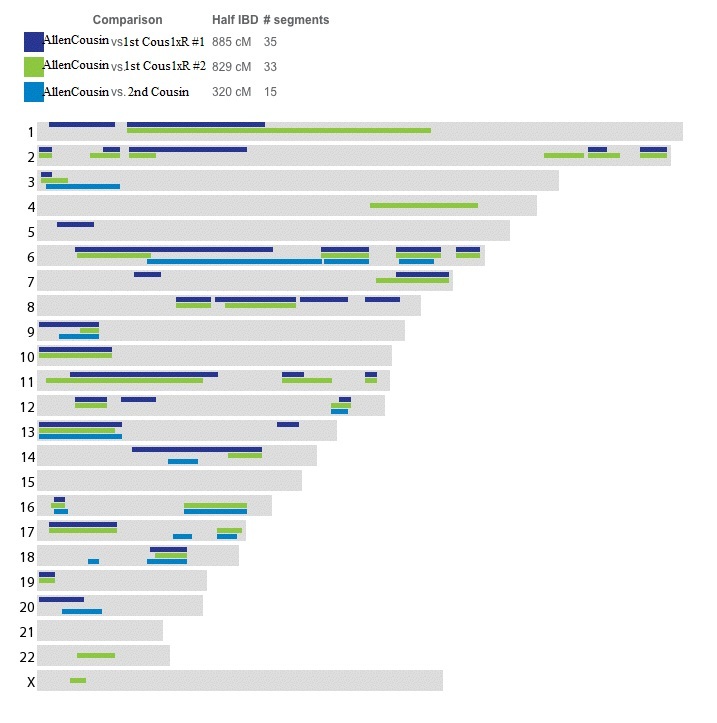 As usual, you can see the unique pattern of inheritance, with each sister sharing different portions of their genome with this cousin (shared DNA with each illustrated by the three different colors). You an click on the chart to get a closer look. Chromosome #6 is especially interesting because we all share a majority of that chromosome with our cousin, meaning that for all three of us siblings the Chromosome #6 that we inherited from our father was inherited almost exclusively from his mother Wanda and, in turn, his Allen grandparents. At the same time, we can be confident that our Allen cousin inherited his maternal Chromosome #6 almost entirely from his grandmother Flora and her parents George and Fredrikka. In my experience, it is a bit unusual to see such a large portion of DNA inherited intact over multiple generations such as this, especially by all tested descendants. Conversely, you can see that none of us have inherited any common DNA on Chromosomes #4, 5, 8, 10, 11, 15, 21, 22 or X. That doesn't mean that we didn't inherit any DNA from our Allen great grandparents on those chromosomes, only that we cannot detect any in this comparison due to the lack of shared DNA in those areas. In order to be able to detect the common ancestors' DNA, BOTH sides must inherit the same genetic blocks. If we tested this cousin's siblings, we would, almost certainly, be able to pinpoint more DNA from the Allens in myself and in my close family members. Next I compared our Allen Cousin against three of his second cousins once removed, children of the sisters in the first chart. 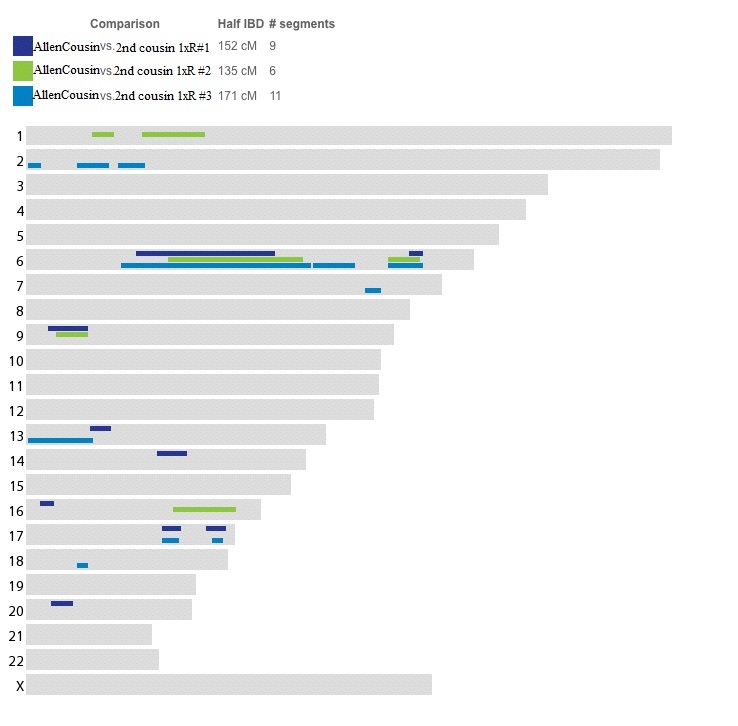 As you can see they retained much of the common DNA on Chromosome #6, but lost many of the other blocks of DNA that their mothers had in common with the Allen Cousin in the first chart. Overall, they were still on the high sharing side with 2.29%, 2.02% and 1.81% instead of the expected average percentage of 1.563% between second cousins once removed. Below is a closer look at the autosomal DNA inheritance pattern of one of the sisters and her offspring compared to our Allen Cousin. 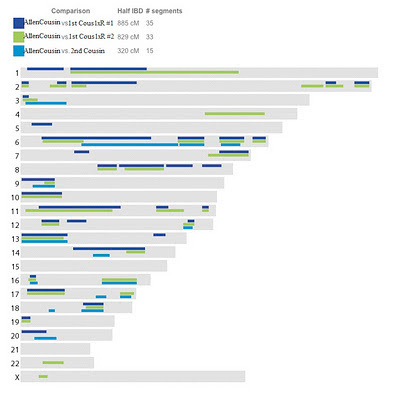 You can see that most of the DNA in common was retained on Chromosomes #2, 6, 13 and 17, while much was lost on Chromosomes #3, 9, 12, 16 and 18. Lastly, I compared my aunt and uncle to this cousin. Although they are first cousins once removed, they share so much DNA with him that they would appear to be full first cousins. In fact, that is what 23andMe predicted their relationship to be with 11.8% and 11.1% of their DNA in common. 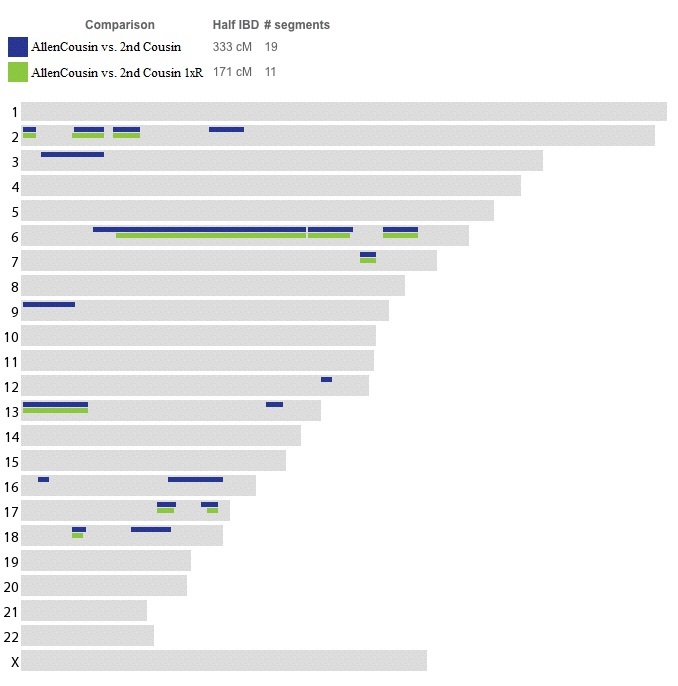 Since first cousins are expected to share an average of 12.5% of their DNA and first cousins once removed are only expected to share approximately 6.25% of their DNA, you can clearly see why 23andMe's software reached this erroneous conclusion. The chart below illustrates my cousin's DNA in common with my uncle, my aunt and myself. In contrast to my sisters and I, who are one generation further removed, my aunt and uncle share DNA on almost every chromosome with him. 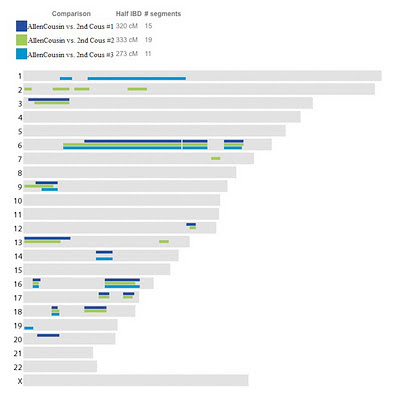 Since I do not have my deceased father's DNA sample at 23andMe, I added myself to the chart to demonstrate the different inheritance patterns of each of the siblings. The areas where I alone share with him (light blue) shows that my father inherited those sections in common with our Allen Cousin, and his siblings did not (dark blue and light green). For instance on Chromosome #3, my father inherited a longer stretch of DNA in common with his Allen Cousin than his siblings did. On the other hand, my father's sister inherited stretches of DNA in common with our cousin on Chromosomes #4 and #22 that we did not. Look again at Chromosome #6. 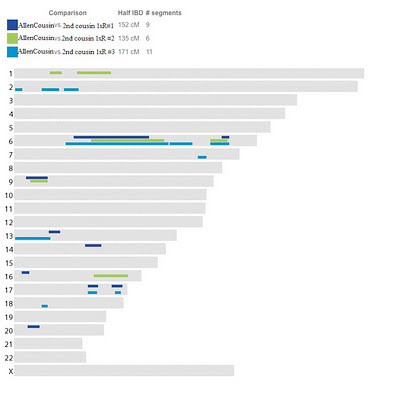 It is interesting to see that my father's siblings also inherited large blocks of DNA in common with our cousin on that chromosomes, however they are not the exact same blocks that my father inherited, which can be seen clearly in the earlier chart from the three sisters' inheritance. My aunt did not inherit the same DNA as her cousin in the center part of her Chromosome #6, while her brothers did. I love being able to actually "see" DNA from my Allen great grandparents. Now that I have second cousins from all of my ancestral lines, my next step is to combine the data from each of my second cousin studies to begin to map out my great grandparent's DNA on my chromosomes and those of my close family. Isn't that exciting? You are doing a great job of pioneering the interpretation of the results of autosomal DNA testing for family history reconstruction. Nice post CeCe! Do you have any first cousins twice removed available to test? I really like these relatives because they share the same percentage of DNA as a second cousin, but allow you to narrow in on one specific great-grandparent rather than a married couple. I've got one tested so far and he has been very useful. Last weekend, I just realized that a sibling of my great-grandfather (born in 1860) had several children very late in life, and these children are actually still living! So I am doing my DNA happy dance now. I never even really considered that someone born in 1860 would still have living children. But now I have about eight first cousins twice removed who are alive and I am hoping that at least a few will be willing to test. Andrea, that is really neat. I don't know if I have any living 1st cousins twice removed. I was in contact with one, but she doesn't respond any more. :-( Many of my ancestors were the only ones in their family to have offspring and others were the youngest in the family, so that may preclude the possibility. Please keep us updated on your testing adventures!